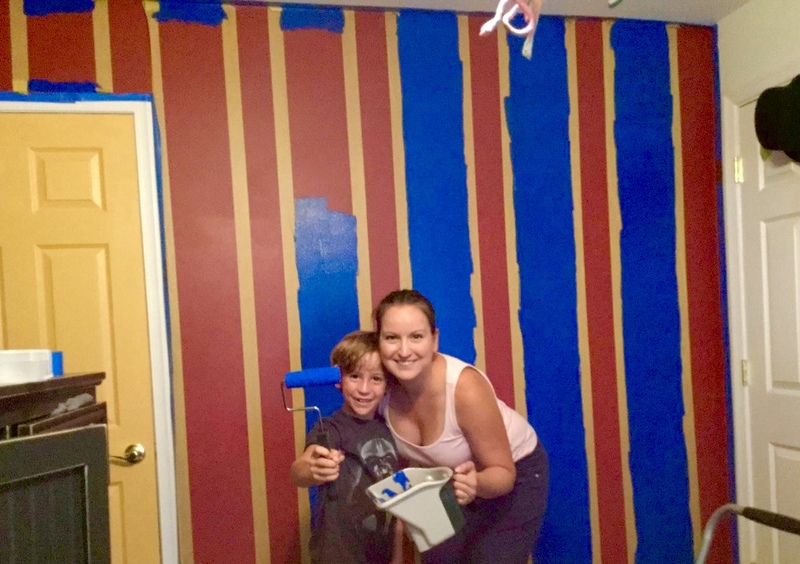 Jennifer and Spencer painting the stripes on that wall. FrogTape was the answer. Jennifer and her son Spencer came in to the paint shop on a mission. 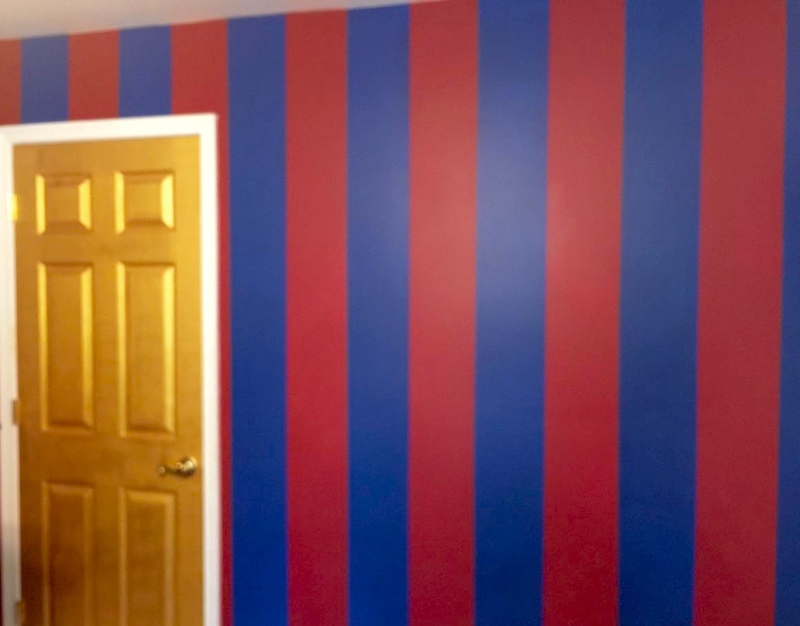 Jennifer had given Spencer the OK to paint one wall in his bedroom any way he wanted to. Personally, I love it when parents do this and then actually keep their word! Jennifer said she was expecting him to choose an electric bright green or a wild orange. 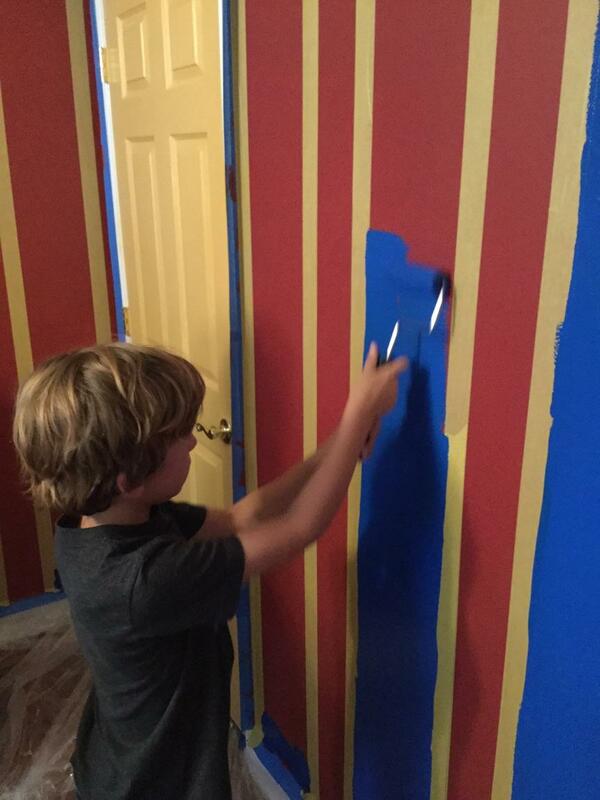 But Spencer knew exactly what he wanted: a wall of stripes in his soccer team colors. Get ready: a royal-ish blue and a dark red. We went through many versions of reds and blues and settled on Benjamin Moore’s Evening Blue 2066-20 and Pomegranate AF-295. “Oh, wait. There’s a closet door on that wall. What do you think? An Off-white.” No way, Mom! To keep with the team logo, the door would be either a bright true yellow or an honest-to-goodness shiny metallic gold. Guess which one Spencer chose. Spencer showed up in the paint shop yesterday all smiles, with Mom and Dad Nick in tow. They love how it turned out, and they had a great time doing the process together. Love my job. Spencer rolling out his dream wall. OMG. Now I want that golden closet door to open onto to something magical. Great job, People. 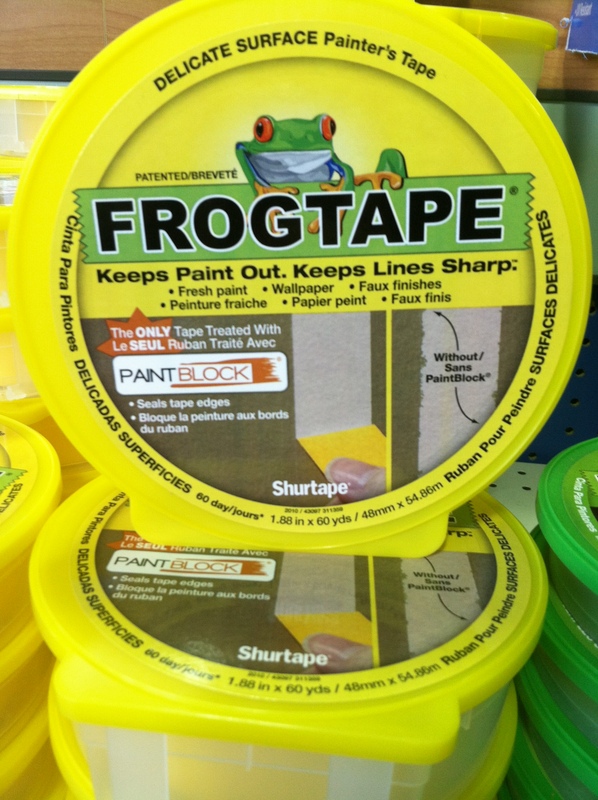 TIP FOR PAINTING STRIPES: Jennifer says to tell you, Readers, that the yellow Frog Tape was the key to the success of their stripe-ification project. Every line was straight and crisp. Straight lines. Crisp and Clear. This is the stuff to use when painting stripes. Small Spaces deserve color, too. Thank you!